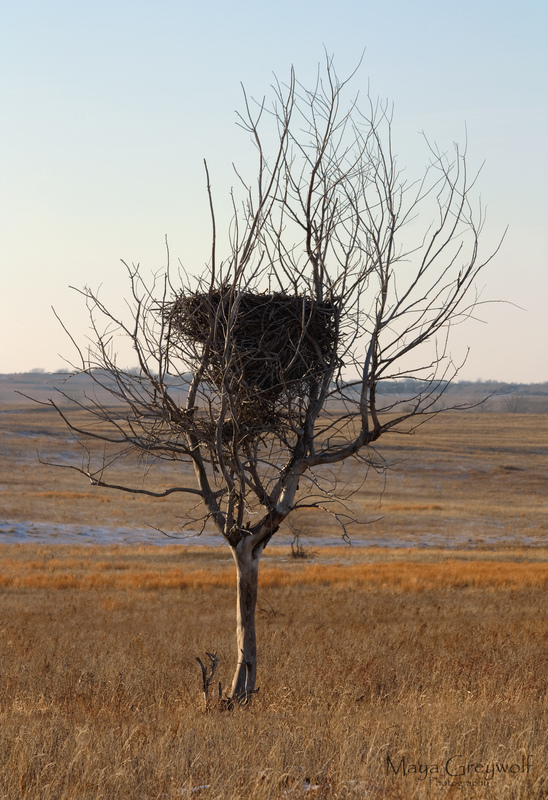 I caught a view of this abandoned nest while traveling the back roads of North Dakota last winter. Granted, there are few trees on the prairies but a VERY big bird had to have been VERY desperate to choose this little, bitty tree to build such a huge nest. This photo reminds me of the out stretched branches as our arms holding the weight of our troubles , pains & hurt in life. The large bird that built this large nest in the tiny branches of the tree did not break or bend them , so to as we carry the burdens of life we need to remind ourselves nothing shall break or bend our spirit. Looks like something from Dr Seuss! Great shot. Your words accompany the picture perfectly. Very nice interpretation. maybe there’s no more vacancies…nice one!